This Thanksgiving lesson reminds students of how lucky they are to be able to come to school every day and get a good education! The "Thankful for" bookmarks allow them to reflect on the part of school they are most thankful for, after reading about educational opportunities in other countries. 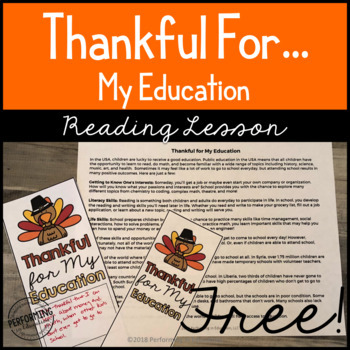 Engage in fun standard-aligned reading review for Thanksgiving with Escape from the Turkey Farm!